For 2019 André is asking Shall We Dance? as he invites you to join him in the comfort of The Elgiva, welcoming you into the beautiful and historic town that holds such special memories for both André and his fans throughout the world. Performing live from the stunning medieval town square, André is accompanied by his 60-piece Johann Strauss Orchestra, who he has travelled the world with for over 30 years, as well as a cast of over 100 dancers. 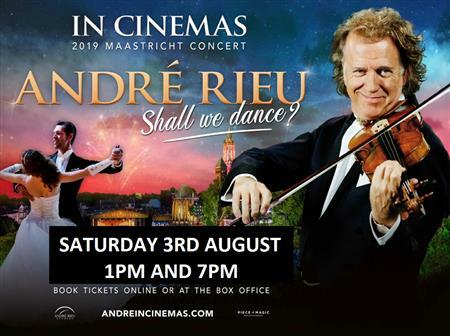 Having performed to millions over a career to which accolades do no real justice, audiences at The Elgiva will be able to live the live André Rieu experience on Saturday 3rd August, as he looks forward to welcoming them to his hometown – the musical town of Maastricht, for an unforgettable cinema experience unlike any other.